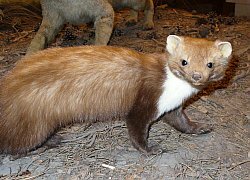 Full title: Behaviour of captive-reared and wild-caught stone martens (Martes foina) after re-release, and the effectiveness of translocation as a managing tool. It is common practice to rehabilitate wounded or orphaned wildlife with the intention of re-releasing them into the wild, or to capture, trans-locate and re-release animals that cause disturbance to humans or damage property. The proposed project aims to investigate the post-release behaviour of stone martens (Martes foina) and to assess the welfare implications and practical efficiency of re-release as a management strategy. Stone martens have been chosen as subjects because they are common in urban and rural environments throughout most of Europe including Luxembourg, and they are responsible for various sources of human/wildlife conflict. Captive reared orphaned and wild-caught adult stone martens will be radio tracked after rerelease, and their behaviour and survival rates recorded under two different release regimes (‘soft’ and ‘hard’ release). A questionnaire survey will be conducted to see whether the problems that led to the capture and relocation of the wild-captured adult martens ceased after the removal of the martens from their territory; or whether the territory was reoccupied and the problems persisted. The overall aim of the study is to improve re-release protocols so as to (a) optimize the chances of survival and the welfare of the re-released stone martens after and during the process of release, and to (b) minimize the likelihood of further human/wildlife conflict. Supervisor at university: Prof Timothy J. Roper, Biology & Environmental Science, School of life sciences, University of Sussex. Supervisor in Luxembourg: Edmée Engel, Musée national d’histoire naturelle Luxembourg. PhD granted by Fonds national de la recherche Luxembourg. Duration: 3 years (20.04.2009 – 19.04.2012). Host institution: Fondation faune-flore @ Centre de recherche scientifique, Musée national d’histoire naturelle. Mevis L (2005) The influence of social rank and environmental factors on the behaviour of captive ostriches (Struthio camelus) in Central Europe (Luxembourg). Bachelor Thesis, Anglia Ruskin University. Mevis L (2006) Processes underlying the spread of a novel behaviour through a group of long tailed macaques. Masters Thesis, University of Utrecht. Mevis L (2007) Post-conflict Behaviour in free-ranging male stumptail macaques (Macaca arctoides). Masters Thesis, University of Utrecht. Richter C, Mevis L, Malaivijitnond S, Schülke O, Ostner J (2009) Social Relationships in Free-Ranging Male Macaca arctoides. International Journal of Primatology 30, 4: 625-642. Mevis L, Richter C, Ostner J, Schülke O (2007) Post-conflict behaviour in free-ranging male stumptail macaques (Macaca arctoides). 2nd Congress of the European Federation for Primatology. Charles University, Prague.